Learn more about the opportunities available for volunteers. Volunteers participate in Nisei Week activiites. Volunteers are sometimes portrayed as those who staple papers and stuff envelopes. That is a fairly limited view of what the Volunteer Program of the Japanese American National Museum has to offer. YES, we do often stuff envelopes and make copies, but the work of the volunteer goes far beyond this. 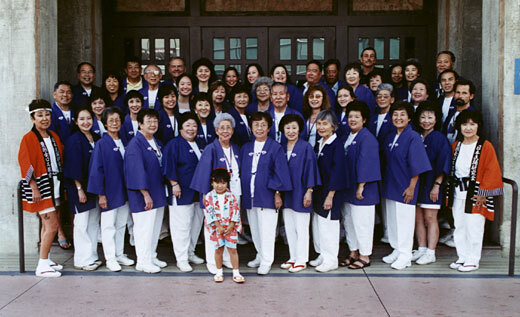 Volunteers at the Japanese American National Museum participate in all aspects of the Museum’s operation. As a volunteer you will find yourself in a personally rewarding atmosphere of art and historical exhibitions, lectures, arts & crafts classes, musical and stage performances, film and video screenings, panel discussions, field trips, food fairs, and much more. You will quickly discover that the Museum maintains a busy schedule of activities! The fragrance of Japanese food has been known to fill the halls as guest “chefs” provide demonstrations in weekend cooking classes. Many also come to learn and then teach our visitors the disciplines and delights of origami and flower arranging. Gloves and masks? It looks like surgery, but it is really the task of documenting and caring for Museum artifacts and historical collections. We are a Museum without walls. We desire to share our message and mission with schools, churches and community organizations. Community Outreach volunteers travel as speakers or ambassadors to introduce the Museum to the broader American community. From the most basic data entry to website design, we welcome any who can offer their expertise in this area. Good with a hammer? The Museum’s exhibitions are crafted with the utmost care. Can you help in this area? Docents are the Museum’s “faculty,” providing explanations and backgrounds for the Museum’s many exhibitions. Gallery Docents provide visitors with an in-depth explanation of the Japanese American experience. Volunteers assist visitors access information about the Japanese American experience through written resources, web access, and microfilm. Front or back? Volunteers assist in the operation of the Museum Store. You can serve up front with the public or in back with stocking and packing store inventory. Work together with Museum staff in creating publications, correspondence and assisting in assorted clerical duties. The docents are the Museum “faculty.” School and group tour docents help interpret the Museum’s exhibitions to groups by conducting Museum-wide tours. Volunteers work together with staff in planning such events as New Year Family Celebrations, Museum participation in Nisei Week and other community events. Extend the warmth of the Museum experience by working as a greeter welcoming visitors to the Museum.